This strategy uses Distillate’s proprietary selection criteria to eliminate stocks with the least stable fundamentals, the most debt, and the least attractive valuation from a starting universe of the roughly 500 largest U.S. listed companies. The resulting portfolio holds 100 stocks and is rebalanced quarterly1. More information on our methodology and approach to valuation, quality, and risk are available on the process section of our website. A copy of our GIPS Compliant presentation can be downloaded HERE. * 2017 performance represents the period from 5/31/17 (inception) to 12/31/2017. ** Since inception performance represents the period from 5/31/17 (inception) to present (the date noted on the chart or table). 1 Due to corporate actions, the actual number of holdings can vary slightly around the target of 100. 2 Data for the S&P 500 reflects the holdings of the IVV ETF. Data for FSV reflects the constituents of a representative composite account. 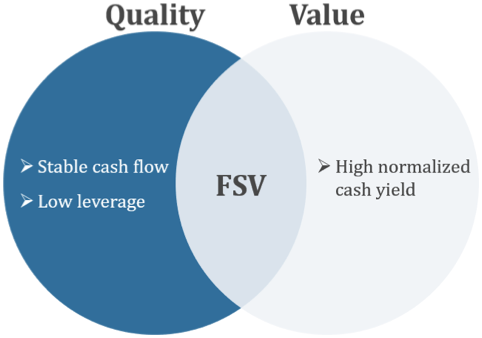 Glossary of terms: Free Cash Flow Yield refers to Distillate’s proprietary cash flow-based valuation metric. It measures a company’s annualized, estimated, adjusted free cash flow over a multi-year period relative to its adjusted enterprise value. P/E is a measure of per share market value compared to FY2 EPS estimates, downloaded from FactSet. It excludes PE ratios less than 0 or greater than 100. Fundamental Stability is a measure of cash flow stability over time, calculated as a regression statistic of cash flow per share against time, and looking back multiple years with actual reported data, and forward multiple years using estimated data. Leverage is an unadjusted measure of a company’s Net Debt compared to its estimated FY1 Earnings Before Interest Taxes Depreciation & Amortization. Disclosures: Distillate Capital Partners, LLC (“Distillate”), is a registered investment adviser with United States Securities and Exchange Commission in accordance with the Investment Advisers Act of 1940. The firm’s list of composite descriptions is available upon request. Distillate claims compliance with the Global Investment Performance Standards (GIPS®) and has prepared and presented this report in compliance with the GIPS standards. Distillate has been independently verified for the periods June 1, 2017 through November 30, 2018. The verification report is available upon request. Verification assesses whether (1) the firm has complied with all the composite construction requirements of the GIPS standards on a firm-wide basis and (2) the firm’s policies and procedures are designed to calculate and present performance in compliance with the GIPS standards. Verification does not ensure the accuracy of any specific composite presentation. To receive a GIPS compliance presentation and/or our firm’s list of composite descriptions please email your request to info@distillatecapital.com. The U.S. Dollar is the currency used to express performance. Returns are presented net of management fees and include the reinvestment of all income. For non-fee-paying accounts, net of fee performance was calculated using a model management fee of .39%, which is the highest investment management fee that may be charged for this composite. For accounts calculated with a per share, net-of fee NAV, gross performance was calculated by adding back the unitary fee associated with that fund. Policies for valuing portfolios, calculating performance, and preparing compliant presentations are available upon request. The investment management fee schedule for the composite is 0.39%; however, actual investment advisory fees incurred by clients may vary. The U.S. Fundamental Stability & Value composite seeks to distill a starting universe of large cap U.S. equities into only the stocks where quality and value overlap using Distillate’s proprietary definitions. Its goal is to achieve superior compounded long-term returns by limiting downside in periods of market stress, while still providing strong performance in up markets. This composite was created in May 2017. The information contained on this website is for informational purposes only and should not in any way be considered investment advice or a recommendation of any security or investment product. Information contained herein has been obtained from sources believed to be reliable but cannot be guaranteed. The information contained on this website is believed to be accurate as of the date published. Actual performance information may be referenced on this website, and represents past performance and is not indicative of future returns. Hypothetical performance data of the firm’s strategies (or components of), where noted, carry with them significant limitations and do not represent the investment returns of actual client accounts, nor some of the costs of implementing an actual investment strategy, such as transaction costs. Hypothetical performance is just that, and there is no guarantee future performance will match these models. To the extent this website contains information about specific companies or securities including whether they are profitable or not, they are being provided as a means of illustrating our investment process. Distillate’s clients may or may not have owned these securities at the time this material was published or read. References to specific companies or securities that appear attractive on Distillate’s methodologies are not a complete list of securities selected for clients.